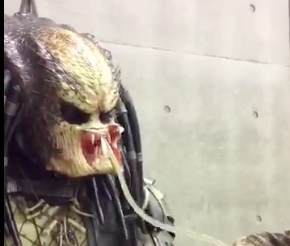 Tokyo Comic-Con saw cosplay collective Harashiylabo’s Predator in full force. We all know how difficult a cosplay mask can make simple tasks like eating, drinking and talking difficult. Harashiylabo’s genius seems to have been in just how natural the Predator costume appears as it manipulates a straw to refresh its pilot. This is another everyday issue faced in costume following from Jason Momoa’s recent embarassing complaint about his Aquaman costume.